Cats are lovable pets. But some members of the clan are majestic when in wild. They are born to chase and hunt. And one such furious member of family Felidae is Cheetah. Known for the lightning speed at which it travels, these cats can cover a maximum of 71 miles per hour. Cheetahs are primarily found throughout Africa and parts of Middle East. Over the generation, they have evolved so as to adapt themselves. Sadly, they are hunted on a large scale and have lost their habitat. Today Cheetahs are on the list of ‘vulnerable’ animals. But awareness and enforcement of law still gives a ray of hope. Here are top 10 interesting Cheetah facts about the spotted one. Cheetah is the fastest land animal on Earth and also has the fastest acceleration. It runs at the speed of 112km per hour. Their body has an aerodynamic structure. Deep chest, long legs, elongated spine, small rounded head on a long neck and tail helps them to have a run. Even though the Cheetah is the fastest animal, they chase somewhere from 200-300 metres and it is less than a minute. Because long distance will require high amount of energy and Cheetahs get exhausted. This is one of the most common Cheetah facts in the world. Cheetahs are diurnal animals. That means, they haunt during the day, especially during early morning and late afternoon. They haunt animals like rabbits, porcupines, and zebra etcetera. Cheetahs hide and move along their prey and chase them for 20-30 seconds. Then they use their sharp claws to get them down. They hunt during the day because of their poor night vision. Apart from that, there is not much competition as other animals hunt during night. 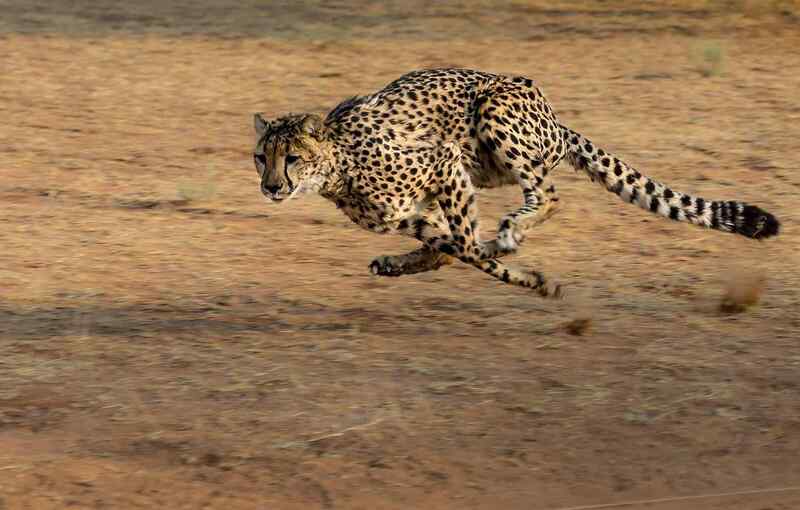 It is the fastest land animal, but there are things that Cheetahs cannot do. They are the only member of the Felidae family that cannot roar. Instead, they growl, hiss, moan, purr and etcetera to communicate. They are extremely vocal. Sometimes birds are conned by their sounds and fall prey. Cheetahs can’t even climb the tree. This is not the same for males and females. Male cheetahs live in group of brothers, either from the same litter or different. This group is called Coalitions. However, females prefer solitary. Males and females interact only during the mating season and the cubs are raised by the female alone. Cheetahs mark their territory by urinating in that place. Newborns are grey in colour with long fur. They weigh somewhere between 5.25-10.5 ounces. Cubs open their eyes after 1-2 week and are largely dependent on their mother. After 6-8 weeks, they accompany her to the hunt and learn from her. At five months, the cubs start playing with one another while applying the skills learnt. At 6 months, the mother teaches the cubs to hunt. She attacks her prey and brings her alive, so the cubs can practice killing. It takes more than a year for a cub to go alone and live on his own. An adult cheetah weighs around 75-143 pounds. They are extremely tall and on an average they stand as tall as 3 feet at shoulders. They are 4 feet in length. Their body is structured to provide them the pace. They have muscular and slim body, with long legs and tail. The large chest and narrow waist, helps them to provide the speed. While chasing, their body temperature goes up to 41 degrees Celsius. Cheetahs have small rounded head and short rounded ears. Male and female cheetahs only meet while mating, otherwise they live separately. Males lick the females to attract them. They mate in dry seasons and after a gestation period of 90-95 days; they give birth to a litter of 3-5 cubs. But if the litter is lost, females go into estrus. They might also abandon the cubs if they don’t find enough food for them in the next 48 hours. However, it is the female take care of the cubs. Cheetahs mostly hunt small animals, but they also hunt bigger animals when in the group. Their retractable grip knocks down the prey and then suffocates it. To save their food from scavengers, they make sure to finish it quickly. Lions, leopards and jackals also take away their hunt. Interestingly, cheetahs drink water once in 3-5 days. They can survive healthy with this practice because they get fluid from their food. Fur is the most eye-catching part of a Cheetah and unfortunately, the primary cause behind mass poaching and hunting. The fur is of tan and golden colour, with black spots on it. Even if it looks silky soft, it is coarse to touch. The long thick tail is also covered with spots that turn into rings. The fur on abdomen and lower part of neck is white in colour. Cubs are born with a medium gray coloured fur, this helps them to hide within the grass and escaping the eyes of other animals. Unfortunately, Cheetah cubs have a high mortality rate. Only 10% of the cubs make to 1 year. Apparently, there are two reasons behind it. The cubs being hunted by the predators is the first reason. Animals like lion, jackals, hyenas and etcetera. The mother has to leave behind the cub and go to get food; this is when the cub becomes an easy target. Even if the mother is around, she cannot fight a bigger hunter. Secondly, Cheetahs succumb to a weak immune system and lack of genetic diversity. But if reach adulthood, they have a lifespan of 12 years in wild and 17-20 years in captivity. Cheetahs have their unique characters and distinct features. They need to be safeguarded and saved from being endangered. While it is necessary to ban hunting in the wilds, it is equally important to create a safe and easily adaptable environment for them in captives. These are the Cheetah facts. Do post your comments.